Opsis and ZooTeens unite at this year’s Living Future unConference. May 26, 2017 – Portland, Ore. – The Opsis-designed and recently completed Oregon Zoo Education Center is the new home to the zoo’s teen programs. The zoo is pursuing the ambitious goal of achieving net-zero energy operations at the center, making it the city’s first and only net-zero public building. The Education Center has been a collaboration of Opsis (as lead design firm), the Oregon Zoo, the Oregon Zoo Foundation, Metro, the U.S. Fish and Wildlife Service, specialized exhibit designers, an entomologist, and numerous non-profit conservation organizations in the region, such as Portland Audubon, the Intertwine Alliance and Friends of Tryon Creek. As part of the design process, Opsis wanted to include ideas from the user groups that would be utilizing the building on a daily basis. During the design phase of the Education Center, the firm worked with youths from the ZooTeen and ZAP programs, who contributed their ideas and concepts to the project. Working closely with Oregon Zoo youth volunteer coordinator Kayla McCurry as facilitator, the studio met with the teens, conducted interactive workshops, and talked with them about their ideas for the project. The teens contributed to selecting finish materials, the layout and furniture used in the designated ZooTeens area. In February 2015, during the design phase of the Oregon Zoo Education Center, ZooTeens convened with Opsis architects to help give input and feedback on design ideas and offer their own ideas for the Zoo Education Center design features. Photo Courtesy of Opsis. ZooTeen Reece France said, “Opsis was very thoughtful in having teens help design. They wanted teen input, which was nice. I felt important, I think a lot of ZooTeens felt important being a part of the process of creating our new space. They were super easy to work with. It seemed like they made the building with care, with us in mind.” France has been involved with the project from the beginning attending the Opsis workshops and participating in the Opsis-facilitated activities to design the building. 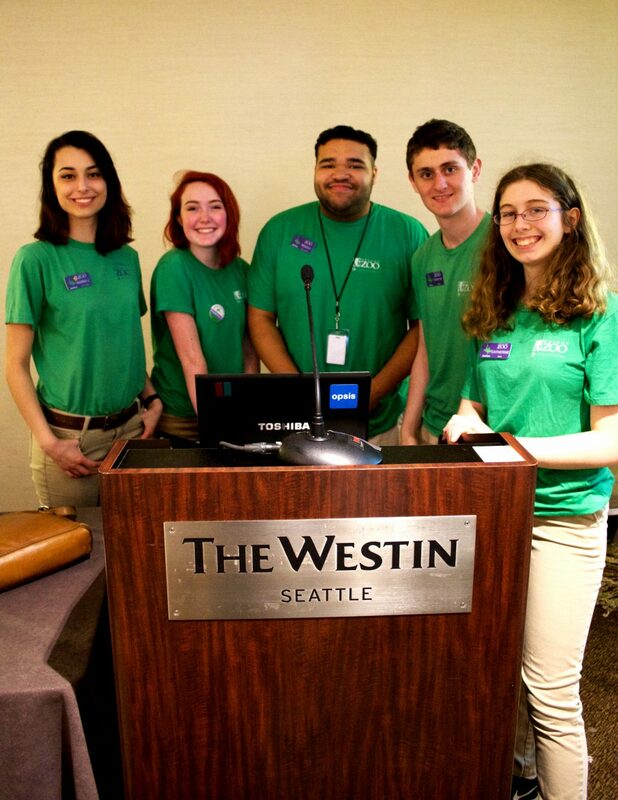 This year 5 ZooTeens participated in the conference: Catherine Mudd (sophomore) Jesuit HS, Noah Weinstein (sophomore) Beaverton HS, Reece France (Junior) Health and Science School, Maddy Eason (sophomore) Southridge HS, and Audrey Lilly (Senior) Lincoln HS. 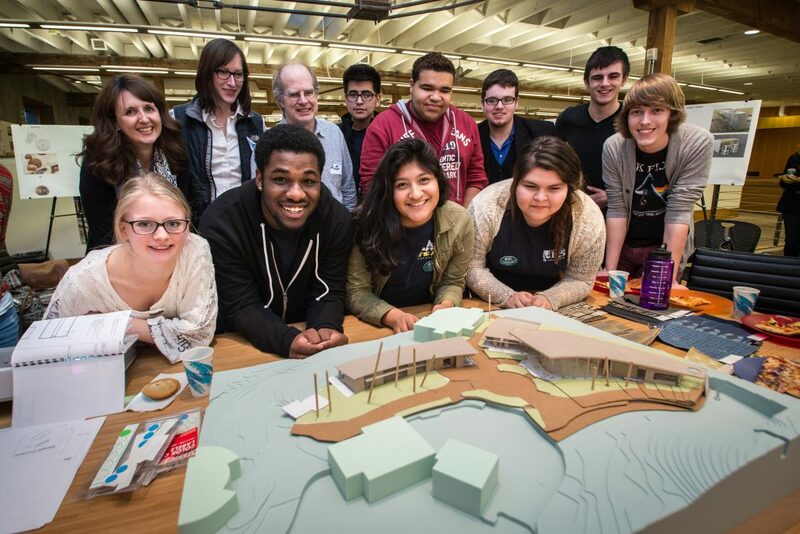 At the Living Future unConference, ZooTeens from Portland area high schools came together to present with Opsis Architecture and Grant Spickelmier, Oregon Zoo education curator. Here the ZooTeens in a group photo from the conference. Photo Courtesy of Opsis. The Opsis | ZooTeens presentation enlisted creative solutions from event participants to design bird-friendly and net-zero energy buildings and educated the group about the Zoo’s mission to inspire respect for animals and action on behalf of the natural world. The ZooTeens led the audience through an exercise to prototype an interactive exhibit based on the eco-services insects provide. 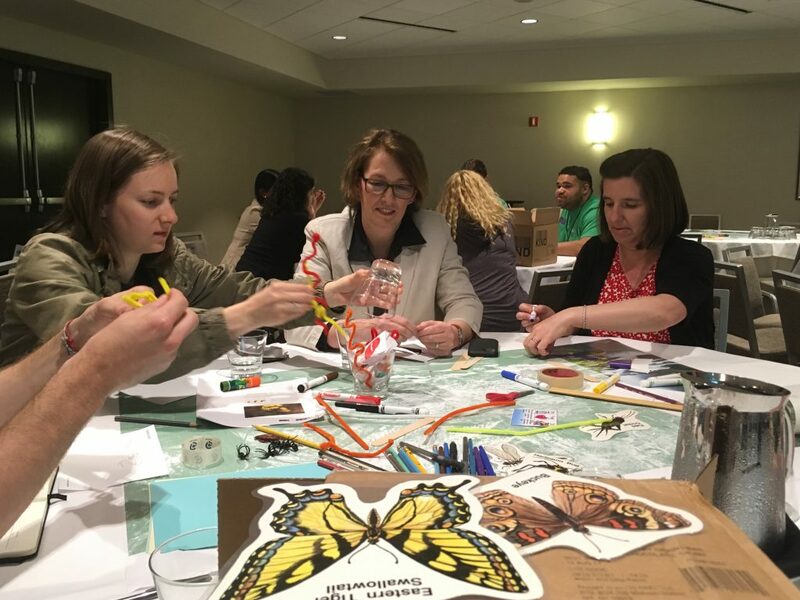 At the unConference, Opsis principal/partner, Alec Holser; associate, Heather DeGrella, and Oregon Zoo education curator Grant Spickelmier worked with the ZooTeens.